First of an ongoing series by Phan Nguyen on the use of the apartheid analogy. Defenders of South African apartheid said blacks were doing better there than in other African countries and South Africa was an asset to the west. Sound familiar? This is the first of an ongoing series of articles I’ll be writing on the use of the apartheid analogy (as opposed to the application of the term “apartheid” under international law). In this initial piece, we’ll explore some of the themes utilized in propaganda on behalf of South African apartheid. Defenders of Israel seek to stress Israel’s unique situation in order to excuse actions against the Palestinians. Yet if we look at the propaganda employed to defend apartheid in South Africa, we find the same arguments in use. The lesson is that if supporters of Israel want to distinguish Israel’s oppressive regime against non-Jewish populations from that of South African apartheid, they should consider avoiding the same specious arguments made to defend South African apartheid. And if we want to know what is wrong with arguments made in defense of Israel, we need only consider why the same arguments fail to make the case for apartheid in South Africa. Here I rely on a study conducted by Philo C. Wasburn of Purdue University (citations at the end). 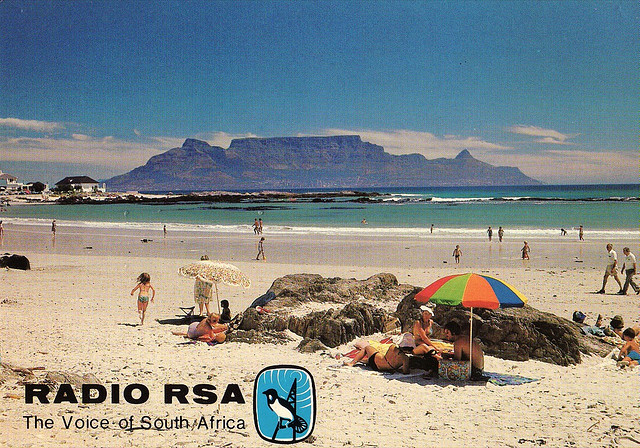 In 1988, Wasburn’s students analyzed five weeks of nightly radio broadcasts from Radio RSA (“The Voice of South Africa”), the South African government’s international radio service, which sought to improve world opinion of the apartheid regime. According to Venter, the main objective of the station is to foster understanding of South Africa’s unique situation in the world and to counteract the untruths and the halftruths about the nation which has been spread worldwide. 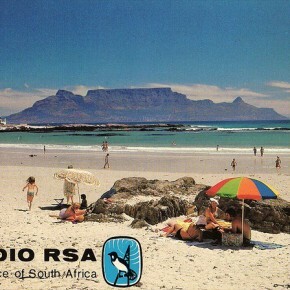 To this end, the [South African Broadcasting Corporation] claims that Radio RSA presents balanced and objective information which enables its audiences to make a more accurate assessment of South African affairs against a background of what it describes as inaccurate and often one-sided coverage given events in South Africa by foreign media. The study took forty-five hours of Radio RSA broadcasts and categorized the narrative into six interrelated propaganda themes, which I summarize below. Theme 1. South Africa is an unusually complex, modern society with a pro-Western government, a vital capitalist economy, vast natural resources, and a rich cultural life with ties to Western Europe. While the nation faces serious, continuing problems of race, exclusive focus on this single aspect of South African society, by the media of other countries, has produced a highly distorted and misleading international image of the nation. [T]he view of South Africa as a modern, productive society with strong cultural links to the West, working to achieve greater participation for all of its citizens in national political and economic life through gradual reform, is introduced in a piecemeal fashion. Nevertheless items depicting day-to-day life in South Africa, music, literature, art, business, science, flora and fauna all carry Radio RSA’s most important message: contrary to the image of South Africa constructed by the international media, and despite admitted difficulties, South Africa is a vital, progressive state with much to admire and is deserving of support from the West. The accusation that a nation is insensitive to human rights or is militarily adventurous calls for the construction and presentation of a national image inconsistent with the labeling. The distinction between issue-specific and what will be termed thematic counterpropaganda is not hard and fast. However, it does clarify how manifestly nonpolitical material can be employed as a form of counterpropaganda. Even the most cursory glance at the programming schedules of the major international broadcasting organizations reveals that a substantial amount of broadcast time is devoted to the transmission of materials such as music, sporting events, verbal travelogues, cultural affairs, business, and features purporting to depict daily life in the nation. Although lacking obvious political content, numerous analysts have contended that such cultural materials can effectively promote particular values and national images that serve political and economic interests. Benevolence–malevolence is a common cognitive dimension of international images attributed to nations. A likely reason for allocating time to materials lacking obvious political intent is that they can cultivate a more benevolent image of a nation. Such materials do not evoke the resistance aroused by assertions that deal explicitly with political events, conditions, policies, principles, or other potentially controversial matters. The goal of such strategy is to disprove that Country X is a “bad” country by demonstrating that it produces some “good.” If the country does good, then criticism of the country as “bad” cannot be correct. This assists us in parsing the strategy behind campaigns such as pinkwashing. Of course the flaw is that good actions do not offset bad ones, and criticism of a nation’s actions are not offset by positive labels ascribed to the country as a whole. The branding theme seeks to determine whether a country is inherently good or bad, thus deflecting criticisms of what the country’s government is doing. Theme 2. South Africa is wantonly and hypocritically singled out as a nation that oppresses its people. The government of South Africa is committed to democratic development. To this end, it is working to promote economic advancement, literacy, order, and stability, all of which are social preconditions for the maintenance of political liberties. The great threat to continuing social improvement in South Africa comes from revolutionary forces that are committed to violence and attempt to disrupt peace and legal order. Radio RSA cited an opinion piece by British writer and commentator Simon Jenkins, who at the time had just returned from trips to Israel and South Africa. Jenkins’s piece, titled “People Who Live In Glass Houses: Before the British Begin to Criticise Other Nations on Human Rights, They Should Go to See Ulsters’ Peace Wall,” was published in the Sunday Times on February 28, 1988. 3. There are prominent and successful blacks in South Africa. Blacks are better off here than elsewhere. Theme 3. South Africa has undertaken major programs to improve black–white relations—particularly through increasing black participation in the management of the South African economy. This theme attempted to counter accusations of racism by demonstrating a commitment to improving the situation of blacks in South Africa. For example, the director of the International Executive Service of South Africa discussed a program to develop small, black-owned businesses in Soweto (March 9, 1988) and the director of South Africa’s Urban Foundation described how the South African business community has tried to respond to the social needs of black South Africans (February 19, 1988). Moreover, Radio RSA cited studies proving black success in South Africa. “Contrary to much international criticism that blacks in South Africa lack opportunities, a recent survey shows that increasing numbers of black businessmen are reaching the top in the executive field with local companies. Theme 4. South Africa maintains a policy of peaceful co-existence and helpfulness toward the other nations of Africa. Theme 5. Efforts by foreign states to influence South Africa’s domestic policies through the imposition of negative economic sanctions are both futile and counterproductive. South Africa’s economy is fundamentally sound. A slide backward into recession, unemployment, and falling real income would worsen social problems. The nation’s social-political difficulties are complex and can be solved best by its own people. Critics of BDS against South Africa often claimed that reforms were under way but could be hindered by negative actions that forced white South Africans to react defensively and “circle the wagons”—often referred to by its Afrikaner term as the “laager” mentality. The International Freedom Foundation, cited above, was a DC-based think-tank covertly funded by the South African government to promote the government’s interests. 6. South Africa resides in a tough neighborhood; South Africa is an asset to the West. Theme 6. Political and economic instability is widespread across southern Africa. The chief sources of such problems are tribalism, incompetence, crime, corruption, and, most important, foreign interference. South Africa deserves Western support because of its potential as a major stabilizing force on the subcontinent. With the assertion of this theme, South African national image construction comes full circle. It has moved from the defensive position that criticisms of South Africa’s domestic and foreign policies are based, for the most part, on misunderstanding are hypocrisy, to the offensive position that criticism and negative sanctions should be replaced by various forms of support for South Africa from the West. The position that the Republic of South Africa contributed to such stability as there was in southern Africa, rested on many of the same items presented in support of Theme 4, which expressed South Africa’s helpfulness toward the other nations of the continent. Additional items also were presented that expressed South Africa’s importance to the overall economy of Africa. I have provided only a brief introduction to the themes employed by South Africa in defense of its apartheid regime. The study cited here had significant limitations. It was an analysis of a one-month period of radio broadcasts, from February 6 to March 5, 1988, constituting forty-five hours of programming. The themes were acknowledged to be both arbitrary and interrelated. Moreover, the study only concentrated on one medium through which the original apartheid regime disseminated propaganda. There were other methods by which it attempted to get its narrative across and defend itself from criticism. In future articles, either on Mondoweiss or elsewhere, I will address more specific arguments made in defense of South African apartheid and directly relate them to current arguments in defense of Israel. I will also be addressing other aspects of the apartheid analogy beyond the arguments made by both South Africa and Israel. Wasburn’s study was published in at least three different sources, cited below. “The Construction and Defense of National Self-Images: The Case of South Africa,” Journal of Political and Military Sociology, 17:2 (Winter 1989), pp. 203–221. “The Counter-Propaganda of Radio RSA: The Voice of South Africa,” Journal of Broadcasting & Electronic Media, 33:2 (Spring 1989), pp. 117–138. Broadcasting Propaganda: International Radio Broadcasting and the Construction of Political Reality, Westport: Praeger, 1992, pp. 117–138.